Edmund Bullock, at four years old, had to stand on a front pew to be seen when he started singing with his church’s choir in Boston, Massachusetts, and performing with his father, uncle, and older brothers. Gisela Morgan was two when she began singing with her identical twin sister Myrna on the island of St. Kitts in the British West Indies. Edmund’s family group, The Bullock Brothers, have had a long and successful ministry—nearly 70 years to date. Gisela and Myrna Morgan, after migrating to Boston, sang together for 15 years—first as Double Blessing, then simply The Morgan Sisters—and were acclaimed throughout the U.S. and beyond. Edmund and Gisela were united in marriage and ministry in January 2006, professionally calling themselves DEVOTED (to God and to one another). 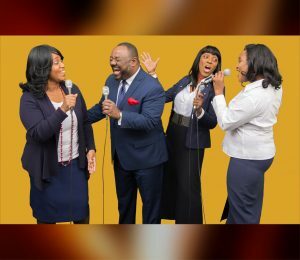 From the beginning they blended their individual styles, personalities, and cultural backgrounds to create a unique sound—Edmund, Southern Gospel, Baptist; Gisela, Caribbean and raised singing Wesleyan hymns. DEVOTED writes their own music and it’s firmly Bible-based. They sing with power and conviction. In 2016 Edmund and Gisela’s daughter Geneva and cousin Arletha joined the ministry, making DEVOTED a foursome. DEVOTED is a singing and preaching Ministry. An ordained minister, Edmund has been preaching since the age of fourteen. The group most often provides music and Edmund preaches the Word when they are invited to minster at worship services.